I would like to thank David Neville and Daimark Bennett for proofreading this manuscript. Thanks to Natasha Vereshegina and Liz Benson for testing protocols, Karen Hales for figures of mutants and Cayetano Gonzalez for pictures of mutants and for the time-lapse figure. 1. Fuller, M. T. (1993) Spermatogenesis, in The Development of Drosophila (Bate, M. and Martinez-Arias, A., eds. ), Cold Spring Harbor Laboratory Press, Cold Spring Harbor, NY, pp. 71-147. 2. Lindsley, D. and Tokuyasu, K. T. (1980) Spermatogenesis, in Genetics and Biology of Drosophila (Ashburner, M. and Wright, T. R. F., eds. ), Academic, New York, pp. 225-294. 3. Kerrebrock, A. W., Miyazaki, W. Y., Birnby, D., and Orr-Weaver, T. L. (1992) The Drosophila mei-S332 gene promotes sister-chromatid cohesion in meiosis following kinetochore differentiation. Genetics 130, 827-841. 4. Kerrebrock, A. W., Moore, D. P., Wu, J. S., and Orr-Weaver, T. L. (1995) Mei-S332, a Drosophila protein required for sister-chromatid cohesion, can localize to meiotic centromere regions. Cell 83, 247-256. 5. Miyazaki, W. Y. and Orr-Weaver, T. L. (1992) Sister chromatid misbehavior in Drosophila ord mutants. Genetics 132, 1047-1061. 6. Bickel, S. E., Moore, D. P., Lai, C., and Orr-Weaver, T. L. (1998) Genetic interactions between mei-S332 and ord in the control of sister-chromatid cohesion. Genetics 150, 1467-1476. 7. Bickel, S. E., Wyman, D. W., and Orr-Weaver, T. L. (1997) Mutational analysis of the Drosophila sister-chromatid cohesion protein ORD and its role in the maintenance of centromeric cohesion. Genetics 146, 1319-1331. 8. Casal, J., Gonzalez, C., Wandosell, F., Avila, J., and Ripoll, P. (1990) Abnormal meiotic spindles cause a cascade of defects during spermatogenesis in asp males of Drosophila. Development 108, 251-260. 9. Wakefield, J. G., Bonaccorsi, S., and Gatti, M. (2001) The Drosophila protein asp is involved in microtubule organization during spindle formation and cytokinesis. J. Cell Biol. 153, 637-648. 10. Bonaccorsi, S., Giansanti, M. G., and Gatti, M. (1998) Spindle self-organization and cytokinesis during male meiosis in asterless mutants of Drosophila melano-gaster. J. Cell Biol. 142, 751-761. 11. Alphey, L., Jimenez, J., White-Cooper, H., Dawson, I., Nurse, P., and Glover, D.M. (1992) twine, a cdc25 homologue that functions in the male and female germlines of Drosophila. Cell 69, 977-988. 12. Eberhart, C. G., Maines, J. Z. and Wasserman, S. A. (1996) Meiotic cell cycle requirement for a fly homologue of human Deleted in Azoospermia. Nature 381, 783-785. 13. Eberhart, C. G. and Wasserman, S. A. (1995) Thepelota locus encodes a protein required for meiotic cell division: an analysis of G2/M arrest in Drosophila spermatogenesis. Development 121, 3477-3486. 14. White-Cooper, H., Alphey, L., and Glover, D. M. (1993) The cdc25 homologue twine is required for only some aspects of the entry into meiosis in Drosophila. J Cell Sci 106, 1035-1044. 15. Andrews, J., Bouffard, G. G., Cheadle, C., Lu, J., Becker, K. G., and Oliver, B. (2000) Gene discovery using computational and microarray analysis of transcription in the Drosophila melanogaster testis. Genome Res. 10, 2030-2043. 16. Wakimoto, B. T. (2000) Doubling the rewards: testis ESTs for Drosophila gene discovery and spermatogenesis expression profile analysis. Genome Res. 10, 1841-1842. 17. Castrillon, D. H., Gönczy, P., Alexander, S., et al. (1993) Toward a molecular genetic analysis of spermatogenesis in Drosophila melanogaster: characterization of male-sterile mutants generated by single P element mutagenesis. Genetics 135, 489-505. 18. Maines, J. Z. and Wasserman, S. A. (1999) Post-transcriptional regulation of the meiotic Cdc25 protein Twine by the Dazl orthologue Boule. Nature Cell Biol. 1, 171-174. 19. Tomkiel, J. E., Wakimoto, B. T., and Briscoe, A. (2001) The teflon gene is required for maintenance of autosomal homolog pairing at meiosis I in male Drosophila melanogaster. Genetics 157, 273-281. 20. White-Cooper, H., Leroy, D., MacQueen, A., and Fuller, M. T. (2000) Transcription of meiotic cell cycle and terminal differentiation genes depends on a conserved chromatin associated protein, whose nuclear localisation is regulated. Development 127, 5463-5473. 21. McKearin, D. (1997) The Drosophila fusome, organelle biogenesis and germ cell differentiation: if you build it. . . . Bioessays 19, 147-152. 22. Gould-Somero, M. and Holland, L. (1974) The timing of RNA synthesis for sper-miogenesis in organ cultures of Drosophila melanogaster testes. Wilhelm Roux. Arch. 174, 133-148. 23. Olivieri, G. and Olivieri, A. (1965) Autoradiographic study of nucleic acid synthesis during spermatogenesis in Drosophila melanogaster. Mutat. Res. 2, 366-380. 24. Schafer, M., Nayernia, K., Engel, W. and Schafer, U. (1995) Translational control in spermatogenesis. Dev. Biol. 172, 344-352. 25. Tates, A. D. (1971) Cytodifferentiation during spermatogenesis in Drosophila melanogaster: an electron microscope study. Thesis, Rijksuniversiteit, Leiden. 26. Hime, G. R., Brill, J. A., and Fuller, M. T. (1996) Assembly of ring canals in the male germ line from structural components of the contractile ring. J. Cell Sci. 109, 2779-2788. 27. Fabrizio, J. J., Hime, G. R., Lemmon, S. K., and Bazinet, C. (1998) Genetic dissection of sperm individualisation in Drosophila melanogaster. Development 125, 1833-1843. 28. Fitch, K. R. and Wakimoto, B. T. (1998) The paternal effect gene ms(3)sneaky is required for sperm activation and the initiation of embryogenesis in Drosophila melanogaster. Dev. Biol. 197, 270-282. 29. Ryner, L. C., Goodwin, S. F., Castrillon, D. H., et al. (1996) Control of male sexual behavior and sexual orientation in Drosophila by the fruitless gene. Cell 87,1079-1089. 30. Green, L. L., Wolf, N., McDonald, K. L., and Fuller, M. T. (1990) Two types of genetic interaction implicate the whirligig gene of Drosophila melanogaster in microtubule organization in the flagellar axoneme. Genetics 126, 961-973. 31. Gonzalez, C., Casal, J., and Ripoll, P. (1988) Functional monopolar spindles caused by mutation in mgr, a cell division gene of Drosophila melanogaster. J. Cell Sci. 89, 39-47. 32. Brill, J. A., Hime, G. R., Scharer-Schuksz, M., and Fuller, M. T. (2000) A phos-pholipid kinase regulates actin organisation and intercellular bridge formation during germline cytokinesis. Development 127, 3855-3864. 33. Hales, K. G. and Fuller, M. T. (1997) Developmentally regulated mitochondrial fusion mediated by a conserved novel predicted GTPase. Cell 90, 121-129. 34. Lin, T.-Y., Viswanathan, S., Wood, C., Wilson, P. G., Wolf, N., and Fuller, M. T. (1996) Coordinate developmental control of the meiotic cell cycle and spermatid differentiation in Drosophila males. Development 122, 1331-1341. 35. Gonczy, P., Matunis, E., and DiNardo, S. (1997) bag-of-marbles and benign gonial cell neoplasm act in the germline to restrict proliferation during Droso-phila spermatogenesis. Development 124, 4361-4371. 36. Kiger, A. A., White-Cooper, H., and Fuller, M. T. (2000) Somatic support cells restrict germline stem cell self-renewal and promote differentiation. Nature 407, 750-754. 37. Tran, J., Brenner, T., and DiNardo, S. (2000) Somatic control over the germline stem cell lineage during Drosophila spermatogenesis. Nature 407, 754-757. 38. Boswell, R. E. and Mahowald, A. P. (1985) tudor, a gene required for assembly of the germ plasm in Drosophila melanogaster. Cell 43, 97-104. 39. Kiger, A. A., Gigliotti, S., and Fuller, M. T. (1999) Developmental genetics of the essential Drosophila nucleoporin nup154: allelic differences due to an outward-directed promoter in the P-element 3' end. Genetics 153, 799-812. 40. Church, K. and Lin, H.-P. P. (1985) Kinetochore microtubules and chromosome movement during prometaphase in Drosophila melanogaster spermatocytes studied in life and with the electron microscope. Chromosoma 92, 273-282. 41. Rebollo, E. and Gonzalez, C. (2000) Visualizing the spindle checkpoint in Drosophila spermatocytes. EMBO Rep. 1, 65-70. 42. Giansanti, M. G., Bonaccorsi, S., Williams, B., et al. (1998) Cooperative interactions between the central spindle and the contractile ring during Drosophila cytokinesis. Genes Dev. 12, 396-410. 43. Patel, N. H., Snow, P. M., and Goodman, C. S. (1987) Characterization and cloning of Fasciclin III: a glycoprotein expressed on a subset of neurons and axon pathways in Drosophila. Cell 48, 975-988. 44. Pesacreta, T. C., Byers, T. J., Dubreuil, R., Kiehart, D. P., and Branton, D. (1989) Drosophila spectrin: the membrane skeleton during embryogenesis. J. Cell Biol. 108, 1697-1709. 45. Zaccai, M. and Lipshitz, H. D. (1996) Differential distributions of two adducin-like protein isoforms in the Drosophila ovary and early embryo. 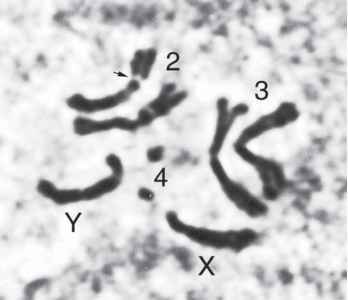 Zygote 4, 159-166. 46. McKearin, D. and Ohlstein, B. (1995) A role for the Drosophila bag-of-marbles protein in the differentiation of cystoblasts from germline stem cells. Development 121, 2937-2947. 47. Callaini, G., Whitfield, W. G. F., and Riparbelli, M. G. (1997) Centriole and cen-trosome dynamics during the embryonic cell cycles that follow the formation of the cellular blastoderm in Drosophila. Exp. Cell Res. 234, 183-190. 48. Gonczy, P., Viswanathan, S., and DiNardo, S. (1992) Probing spermatogenesis in Drosophila with P-element enhancer detectors. Development 114, 89-98. 49. Gonczy, P., Matunis, E., and DiNardo, S. (1997) bag-of-marbles and benign gonial cell neoplasm act in the germline to restrict proliferation during Droso-phila spermatogenesis. Development 124, 4361-4371. 50. Santel, A., Blumer, N., Kampfer, M., and Renkawitz-Pohl, R. (1998) Flagellar mitochondrial association of the male-specific Don Juan protein in Drosophila spermatozoa. J. Cell Sci. 111, 3299-3309.